"The sassy one, from Canada Dry"
I don't like grapefruit,but I sure did drink my share of Wink when I was a kid. Like GlenEllyn, I didn't like grapefruit either, but there was another similar soft drink called 50/50. It wasn't available in my home town, but whenever we visited my uncle in Chicago, he would treat us to a bottle each. He always had a huge stash of them in his garage. It almost felt like a privalege to get one- really good! It may have been a blend of grapefruit and lemon-lime. Yes, I remember drinking Wink. In those days I didn't care for cola. 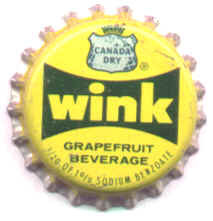 Strange, I don't like grapefruit, but I really liked "Wink, the sassy one - from Canada Dry!"